Glimpsing a hang glider in the skies over WNC is a rarity these days. Yet for more than a decade, the sport was synonymous with Grandfather Mountain. 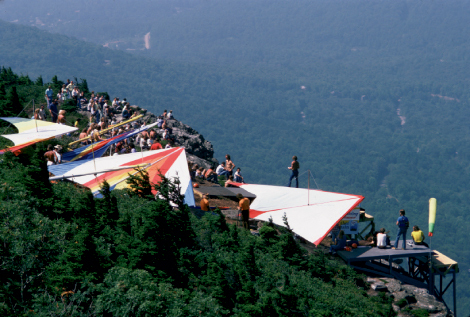 From the mid-1970s to late ’80s, the mountain’s sheer cliffs and consistent winds—with the aid of master promoter Hugh Morton—helped turn hang gliding into a popular spectator sport. In 1974, John Harris of Kitty Hawk Kites approached Morton, the owner of the park, about launching from the top. Harris’ “calm, matter-of-fact approach,” Morton wrote, won him over, and on July 14, 1974, Harris, “became our Lindbergh at Grandfather.” Morton soon began hosting national competitions, including the first Masters of Hang Gliding Championship held in ’76. It was a prestigious, invitation-only event that, for more than a decade, drew the world’s best flyers, including the father of hang gliding, Francis Rogallo. The Masters of Hang Gliding ended after Grandfather’s chief pilot, Stu Smith, died during the 1986 competition. Exhibition flights ended the following year, due in part to changes in kite design. Flyers increasingly rode thermals far above the mountain or soared long distances from it, which made it more difficult for spectators to watch.